While the slope we traveled on was mainly wind protected, as we came closer to the ridge there were clear signs of wind drifted snow including minor cornice development, pillows, and small wind patterns on the ridge proper. 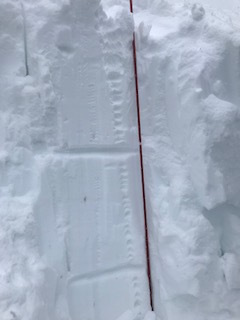 Although we didn't have any noteworthy results from our pit, there were two noticeable weak layers in the snow pack: one at at a depth of 40 cm and the other at 95 cm. These buried weak layers responded to shovel shear tests but not to ECT (ECTX) or CT (CTX)tests, thus while they may not be touchy now, with additional storm snow and wind loading in the next few days, they may become more reactive.